I totally forgot to mention last Wednesday! Year In Hereafter was accepted to the Spider Forest collective where the sister comic Small Trolls, and Elli's Tistow already are, so it's nice to get the whole trio in there. I was really shy about applying for the longest time, but then I finally decided to do it and I'm very happy that they took me in so whole heartedly. 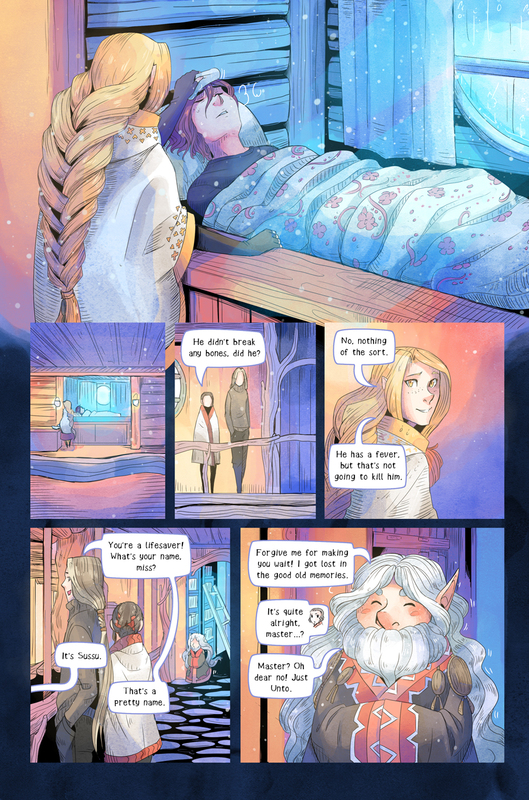 To be completely honest, even though I am happy with how I've been doing YIH recently and how it looks, I do get some moments about the older pages where I feel like I should redraw it all if I wanted to show it around or even print it out. It has taken a long time to get over that critical mindset. We all start from somewhere, just gotta learn some confidence to carry those humble beginnings with you. We're still working on the necessary things to have YIH officially listed into the library, and I think we're looking at taking off the ad from the top. I'll see about applying new ads, but right now I feel like it's not necessary to have them around. In it's stead I'll insert the spiderforest banner instead, as is common within the collective. Also, Suzzen aka Sussu from Bookwyrms is here again~ The cat is prooobably dead now since Ieva has time to interrogate seemingly unsuspectable people. 'cus that's just what she does.